In a multi-shared storage environment between two sites (as shown in the diagram below), each server in each site has access to the storage being shared between the servers at that site. When a DataKeeper mirror is created, one server in each site will be designated as the mirror endpoints of the mirror. In the following example (3×3), a DataKeeper mirror has been created to replicate the X: volume from Site A to Site B. There are three other servers sharing storage in Site B. They share access to the Target volume currently defined to T1. T2 and T3 are referred to as shared target systems. File system access to the target volume is locked on all three systems. All six servers are part of the WSFC cluster, and all of the WSFC protected resources are currently active or “ONLINE” on S1. Switchover to a Shared Source server (S2, S3) is allowed. Switchover to the current Target server (T1) is allowed. 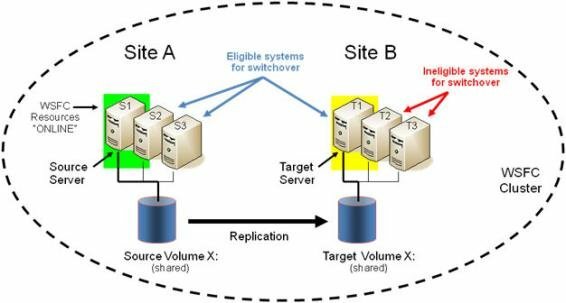 Switchover to a Shared Target server (T2, T3) is not allowed; however, there is a two-step process to switch over to these servers. • First, switch over to the target T1. • Then you can switch over to either T2 or T3 server. In our example, either S2 or S3 is eligible to become the ACTIVE server and source of the mirror. If we switch the protected resources to S2, S2 will become the new SOURCE of the mirror and T1 will remain the Target of the mirror. In our example, switching the protected resources to T1 will effectively reverse the mirror direction making T1 the new SOURCE of the mirror and S1 will become the Target of the mirror. This is not allowed. The switchover operation will fail, but as noted above, a two-step process can be used. The following article describes how Failover Clustering determines which node to fail over to. Important: In an N x N configuration, DataKeeper supports failover to any one of the shared source systems or to the target system. If Failover Clustering tries to online the group on an ineligible system (one of the shared target systems), that online will fail. Failover Clustering will continue trying to online the group on different nodes and eventually succeeds when a system that is eligible for failover is tried.